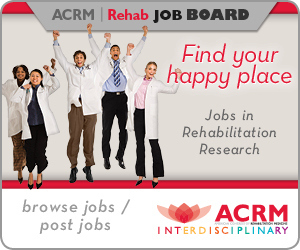 The ACRM Annual Conference is the LARGEST conference in the world for interdisciplinary rehabilitation research. Offering evidence-based education and training for every member of the rehabilitation team. Your spring destination for rehabilitation training and education: The ACRM Spring Meeting offers a wide variety of in-depth, evidence-based, educational activities with CEU/CMEs. PLUS, meet and work face-to-face with ACRM task force members, networking groups and ISIGs to tackle priority projects and make significant contributions to the ACRM annual conference program. The casual atmosphere of this meeting makes it the perfect place to reconnect with colleagues, meet a few new ones, explore opportunities for collaboration, and learn more about the important work of ACRM. Registration includes a printed copy of the manual – a $150 value! Visit this calendar to find meetings and events in rehabilitation.